Teacher, priest, and scientist Johann Mendel was born in 1822 in what was then Austria (now Czechia). His parents were farmers, and as a boy working on the farm he became fascinated with fruit trees and gardening. He was a brilliant student in grade school, and his family struggled to pay his tuition to high school and, later, the Olmutz Philosophical Institute. When he could not afford to attend university, he instead joined the Augustinian monastery, becoming a priest and adopting the new Christian name Gregor. He twice failed the exams required to become a high school science teacher, but still taught on a part-time basis. He was also assigned work as a hospital chaplain, but found it frustrating and difficult, and soon returned to the monastery. At the monastery Mendel tended the garden, and beginning in 1856 he conducted extensive experiments with pea pod plants, tracking some 28,000 individual plants over several years and focusing his attention on seven basic characteristics of the plants. In his experiments, Mendel crossed peas of different varieties — tall, short, various seed shapes and colors, etc. — and kept detailed records of how these characteristics were seen or vanished in subsequent generations. He conducted similar experiments on other plants and on mice, and having been educated in mathematics, Mendel noticed recurring ratios in his analysis of how traits were inherited, ratios which could only be explained through dominance and segregation of genes. In one experiment, for example, Mendel crossed a plant that produces a round seed with a plant which produces a curving, Y-shaped seed, and in each and every one of the resulting plants the seeds were round. In the next generation, however, in which only these round hybrid seeds were planted, 5,474 plants matured bearing round seeds, while 1,850 matured bearing curved seeds — a ratio of almost exactly 3:1. From this Mendel concluded that the round seed is a dominant trait, inherited from either parent, while the curved seed is a recessive trait, seen only when the dominant trait is absent in both parents. Mendel's mathematics revealed the basic laws of heredity — that many maternal and paternal traits do not "merge" in the offspring, but are instead passed intact; that some of these characteristics are dominant while other characteristics are recessive; and that the inheritance of such traits obeys simple statistical laws. 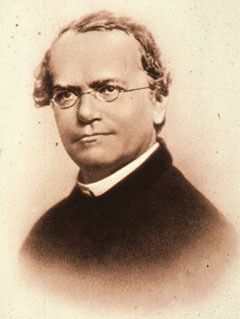 His short monograph Versuche über Pflanzen-Hybride (Treatises on Plant Hybrids) was published in 1865, and is now recognized as among the most important scientific papers ever written. At the time, however, it was not widely read and its implications were understood only by Mendel. Before his death in 1884 he wrote, "I am convinced that it will not be long before the whole world acknowledges the results of my work," and indeed, in the early 1900s three European botanists, working independently, rediscovered what Mendel had explained some 35 years earlier. His research has come to be seen as the first rigorous, scientific explanation of heredity, and the foundation for modern genetics.